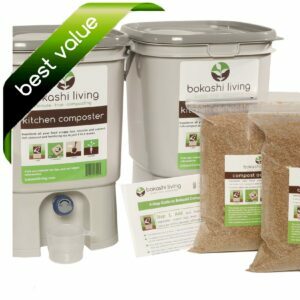 Using bokashi composting you can compost all of your kitchen and food scraps. Vegetable peelings, fruit skins, peels, leftover salads and everything that you would throw in a ‘traditional composter’. Unlike a traditional compost system, you can also add cooked food scraps, meat, bones, dairy, baked goods (bread, cookies etc), egg shells… All food waste! To be honest, it’s probably easier to just think about what should not go in the bokashi kitchen composter. That list is much shorter!! Excess liquids including grease and oil. Too much liquid prevents the good bacteria from thriving and may send your bin bad. Can I put garden waste in my bokashi bucket? We would not recommend putting cut flowers or garden waste in your bin. 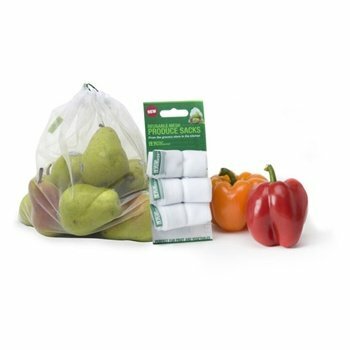 These will break down using the bokashi process but will take up a lot if space in your bokashi kitchen composter and they don’t have a huge amount of nutrient value. Throw your garden waste into your traditional composter or in your city’s green bin scheme. Save your space in your bokashi kitchen composter for items that are going to add lots of nutrients to your soil and those that would be hard to compost otherwise. Can I put compostable plastics in my bokashi bucket? The bokashi process even seems to break down compostable plastics. This statement isn’t based on stringent laboratory tests….. But the compostable plastic spoons that I put in my bin a couple of months ago broke down in my garden soil!! Again, they’re probably not adding much value to my soil but my local curbside green bin program doesn’t accept compostable plastics. If it hadn’t gone in my bokashi indoor composter then it would have gone to the landfill. Can I put rotten fruit that is not yet moldy but acidic into my bokashi bin? It is watermelon that smells very acidic. I have poured out as much of the juice liquid as possible. I responded to your other comment before I read this! Glad to hear you have drained most of the liquid (excess liquid can cause your bokashi bucket to fail). Non-moldy rotten fruit is fine; maybe add an extra tablespoon or two of bokashi bran to be on the safe side as the watermelon sounds like it is close to going moldy. The bokashi fermenting process is naturally very acidic so the acidity of the fruit is not a problem. Can I add moldy cheese if the mold is white and not black or blue? I have some fresh cheese that is about 2 weeks – still white, with some white mold on it. Can I add old white moldy cheese to my bokashi bin? You shouldn’t add excessive amounts of moldy food to your bokashi bin as it can introduce too many bad mold microbes to your bin. However, a small amount of moldy food is acceptable. So, if it is just a small amount (say a few cubic cm’s), then chop it up and spread it through the bin, making sure to add a generous amount of bokashi bran as you do so. If it is a larger amount of moldy food, then it is best to keep it out of the bokashi bin. It’s not worth sending a whole bin full of food waste bad because of one piece of cheese.